Daniel Dean Warthen was born on December 1, 1952 in Omaha, Nebraska. Warthen was an All American High School quarterback, getting college scholarship offers from Nebraska, USC, UCLA, & Northwestern universities. 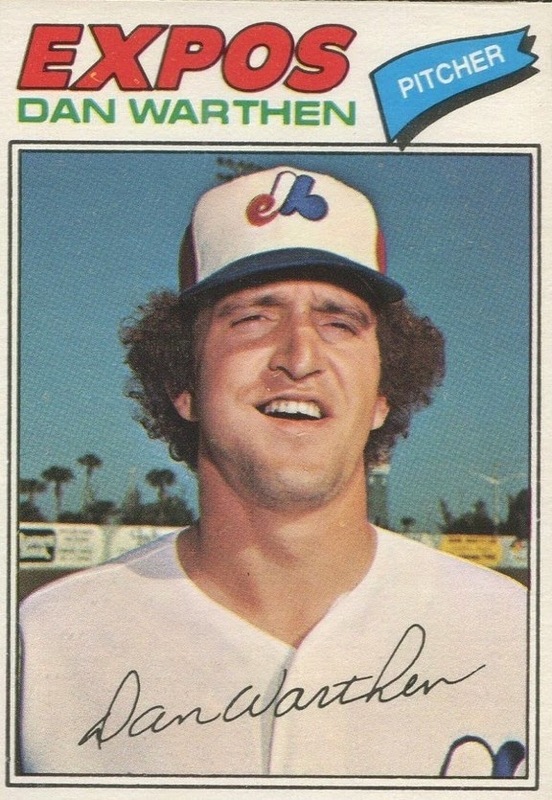 He chose to play baseball instead, getting drafted in the second round, by the Montreal Expos in 1971. The left hander would get brought up to the majors in May 1975 making his debut, pitching a scoreless inning against that years World Champion, Big Red Machine. He pitched in relief in his first few outings, going 4-2 with three saves toward the end of July. He was thrown into the Expo rotation finishing the season at 8-6 with 3.11 ERA, striking out an impressive 128 batters in 167 innings. He also walked 87 batters. The following year he was 2-10 as he walked 66 batters in 90 innings pitched, allowing 53 earned runs. He would only pitch 20 more games in the majors at Montreal, going to the Philadelphia Phillies & Houston Astros over the next two seasons, while going 2-5. In the minors he would win 10 games or more three times, pitching down there through 1982. In 1978 he was the AA Pitcher of the Year at Oklahoma City. Retirement & Coaching: Warthen immediately began to coach when his playing days ended, first with the Pittsburgh Pirates, then with the San Diego Padres & Philadelphia Phillies organizations. In 1992 he was the Seattle Mariners pitching coach, moving to the San Diego Padres (1996-1997) then Detroit Tigers in (1998-2002). 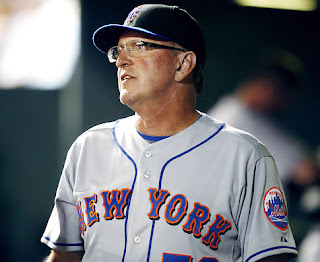 In 2003 he came to the Mets organization, as pitching coach for the Norfolk Tides. He remained there for three seasons, tutoring guys like Heath Bell, Pedro Feliciano, & Aaron Heilman. In 2006 & 2007 he went to the Dodgers serving as bullpen coach under Grady Little. In June of 2008 Warthen was named the Mets pitching coach replacing Rick Peterson. In 2009 he served under manager Jerry Manuel & his pitching staff posted a 4.45 ERA, which was 12th in the league. In 2010 his staff improved to 6th best in the league posting a 3.73 ERA. In 2011 the Met staff won 77 games (10th in the NL) posting a 4.19 ERA (13th in the NL) they tossed six complete games which was their highest ranking in the league stats, fifth place. They averaged in the middle of the league allowing HRs (147-8th in the NL) walks (514- also 8th) & 1126 strikeouts (10th). In 2012 the Mets staff featured twenty game winner R.A. Dickey but other than that the staff only won 54 games. Their total 74 wins was 12th best in the league & their 4.09 ERA was eleventh best. Thanks to Dickey they were second with seven complete games & third in shut outs with five. The teams 1240 strike outs stood out & were sixth best in the league. In July of 2012 Warthen was ejected then later fined after arguing balls & strikes with umpire C.B. Bucknor in game Johan Santana pitched in Atlanta. In The off season the Mets announced their entire coaching staff would return in 2013. 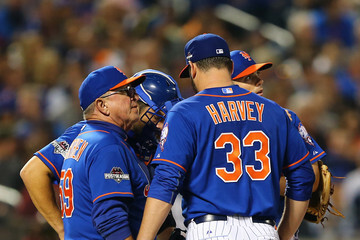 In 2013 Warthen had the pleasure of coaching Matt Harvey, who went on to start for the National League in the All Star Game held at Citi Field. Harvey took the league by storm, blowing batters away & pitching so well, there was a chance of a no hitter every time he took the mound. Harvey had once given credit to Warthen for helping him with a better grip on the ball. 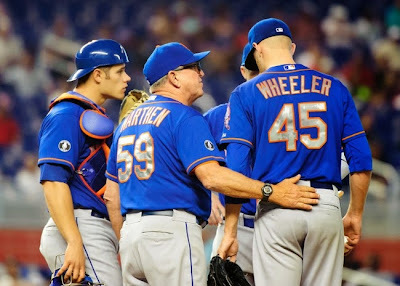 The Mets also brought up another fine young pitcher; Zack Wheeler later that season. 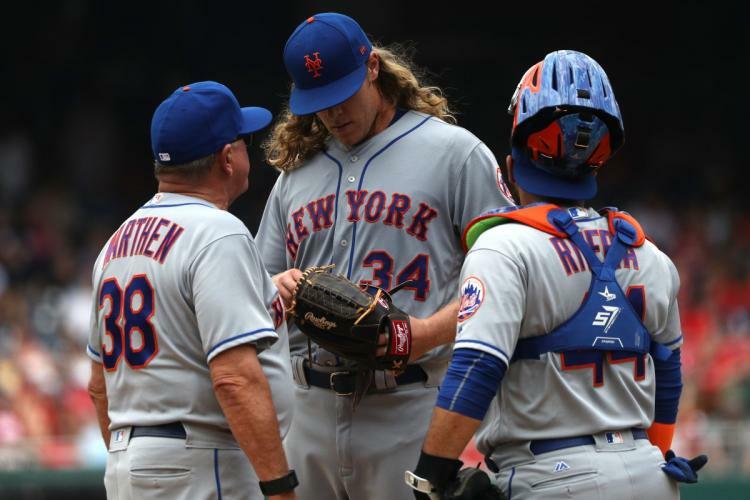 Overall the Mets staff was second in the league in innings pitched, eighth in ERA (3.78) saves (40) ninth in strike outs (1209) & tenth in wins (74). They were also fourth in losses (88) fifth in walks (458) eighth in runs (684) & twelfth in hits (1442). In Spring Training 2014, Warthen made a joke, using the word "Chinaman" toward the interpreter for Daisuke Matsuzaka during an interview. The joke was in bad taste & he made a public apology the next day. Unfortunately, for the Mets Matt Harvey would be out the entire season having undergone Tommy John surgery. The team would soon loose their closer Bobby Parnell after one game & Without the ace of his staff or his closer the pitching coach went to work. Overall the young Mets staff did a fine job, Jenry Mejia eventually filled the closer role (28 saves) & Jacob deGrom brought up later in the year went on to win the NL Rookie of te Year Award. The 2014 Mets finished third in strike outs (1303) fourth in innings pitched (1463) fifth in ERA (3.49) & seventh in wins (79). 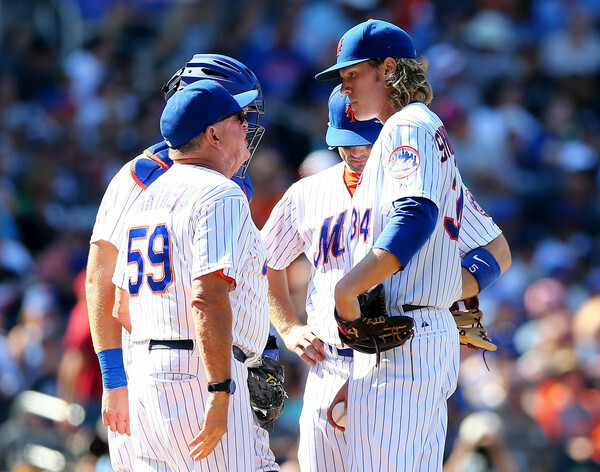 In 2015 good things were anticipated for the Mets mostly due to their young pitching staff. The return of Matt Harvey from his Tommy John surgery, was so good it earned him the NL Comeback Player of the Year Award. Jacob deGrom pushed aside any idea of a sophomore jinx & went on to arguably be the ace of the staff. Veteran Bartolo Colon went on to win another 14 games while eating up innings. During the season fireball throwing Noah Syndergaard was brought up & challenged deGrom & Harvey with strike outs & effectiveness. In late summer another Mets phenom, Steven Matz was brought up, quickly earned a spot in the rotation in the regulars season as well as post season. With all these young outstanding arms, the Mets did not miss Zack Wheeler as much as was originally thought at the start of the season. In late August he was rushed to the hospital after feeling ill, but was eventually released with a clean bill of health. In the bullpen the Mets scheduled closer Jenrry Mejia was suspended for once again violating MLBs drug rules. The 8th inning man from 2014, Jeurys Familia yook the role & became one of the best if not the best in the game. Late season additions Tyler Clippard & Addison Reed made the bullpen solid in the mid & late innings. This all certainly made Warthen's job a lot easier. The Mets won the East as the staff was third in the NL in saves (50) fourth in ERA (3.43) fifth in wins (90) & sixth in strike outs (1337). His staff dominated in the NL rounds of the playoffs posting a 3.48 ERA in NLDS against the L.A. Dodgers. The staff allowed 17 runs with 54 Ks & 13 walks. 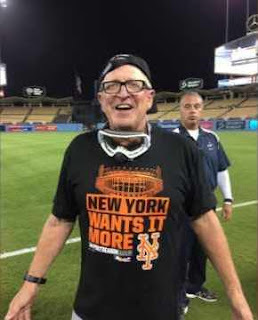 In the NLCS against the Chicago Cubs the Mets staff posted a 2.00 ERA with 37 Ks & 9 walks. 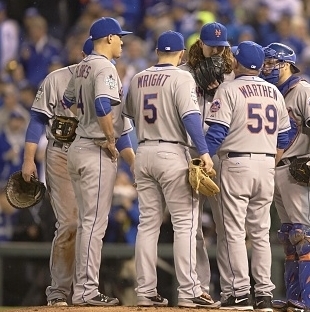 They struggled in the World Series as their ERA rose to 4.21 allowing 24 earned runs, 17 walks & 37 Ks. In 2016 Warthen's pitching staff suffered season ending injuries to Matt Harvey by mid summer & then later aces Jacob deGrom & Steven Matz also went down. 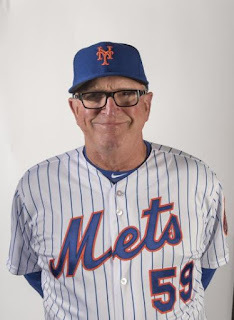 His work with youngsters Seth Lugo, Robert Gsellman & Josh Smoker helped the Mets get to the post season for a second straight year, although they fell in the NL Wild Card Game. The 2016 NL Saves leader Jeurys Familia also credited Warthen with helping him throw a better slider with a better grip. The 2016 staff allowed the fewest walks (439) & HRs (152) in the NL, they were also third in the NL in ERA (3.58) Fourth in wins (84) & first in saves (55). 2017 proved to be an all out disaster for the Mets, especially the pitching staff. With expectations of once again being one of baseball's elites, an injury ridden staff ended up being one of the worst in the league. Warten's staff was 14th in ERA (5.01) 12th in wins (70) 15th innings (1538) 14th in runs (863) 12th in HRs (220) 4th most losses (92) only coming in high in strike outs (1374). At the end of the year Terry Collins was moved to a front office position & all the coaches were let go, Warthen's tenure ended as well. In November 2017 he was hired as an assistant pitching coach for the Texas Rangers.